Someone has written a bot which automatically colourises photos that are sent to it via Twitter. This is what it did with a photograph of the Darualman railway. Note that this is just for fun, and it is not intended to be historically accurate! There is a photo of a “Henschel engine of the first railway at Kabul, stored at Darulaman, 1974” by Dr Wolfram Koehler at the Trains-Worldexpresses website (which also has lots of other interesting pictures of trains in Asia). The New York Times has a very interesting article about the National Museum of Afghanistan, which mentions the steam engines (and links to this website; *waves* to the sudden spike in visitors). While the emphasis is on the ancient, there are more modern artifacts as well — including several rusting steam locomotives in the gardens. “We have them to remind people that at the end of the 19th century, Afghanistan had railroads, while at the end of the 20th, it did not,” Mr. [museum director Omara Khan] Masoudi said. While there were almost certainly no operational railways in the closing days of the 20th century, were there any at the end of the 19th century? It is possible there was something in a factory in Kabul, but I’m not sure whether there were any others. The steam locomotives in the National Museum of Afghanistan date from the 1920s. The country’s only railroad – well, railroad equipment. Two ancient steam engines and tenders given Afghanistan by the late Kaiser Wilhelm of Germany. The train used to make miniature runs from the Parliament building to the palaces in the center of town. Now there’s not even a track and the engines are kept as curiosity pieces. Source: Contrasts Plentiful In Afghanistan, AI Goldberg of AP’s Moscow staff, in the Sarasota Herald-Tribune of 1 February 1960. Another mention of there only being two locomotives in the past – however today there are three locomotives in the museum. It might be noted that the Kaiser had abdicated in 1918, while the locomotives date from 1923. 2-8-2 tank locomotive for the Bolan Pass, North Western Railway of India, from the Boys’ Book of Locomotives by JR Howden, 1907. (Wikimedia Commons, public domain). Details and picture of a GA/S Class 2-6-2+2-6-2 Garratt. More on Bolan Pass steam operations. On top of a hill in a remote area of Uzbekistan is a steam locomotive painted in the colours of the national flag. What is it, and how on earth did it get up there? The locomotive stands on a hill overlooking at Oqrabot (or Акрабат (Akrabat) in Russian) station. Oqrabot is on the railway line from Karshi to Kumkorgan which opened in August 2007, providing a route to Termez which runs entirely within Uzbekistan, eliminating the need to for trains to transit Turkmenistan. The station is said to be the highest point on the route, at 1510 m, and possibly the highest point on the rail systems of the whole CIS. There is a close-up view of the locomotive in August 2010 on the Steam Engine IS website. The locomotive carries the number Эр772-91, which transliterates to Er772-91. A vast number of Series E locomotives were built by a factories across eastern Europe, and this one has a plate showing it was built by CKD at Prague in Czechoslovakia; a date of 1951 is mentioned in the comments on Steam Engine IS (it is of course possible that the plate is a modern addition and the number is incorrect for the particular locomotive). In an article “Red Star Steam” over at the The International Steam Pages, Colin Boocock provides a summary of Soviet standard steam locomotive classes. The Series E was based on a pre-Soviet design. This was developed into the Eu for mass production, followed by the Em and then from 1935-36 the Er, which had a larger grate area and higher superheat; nearly 3000 were built. More than 10 670 Series E were locos were built in total, “by far the largest number of a single type ever to run in the world”. Despite making “a German Kriegslok look small”, many ended their days as shunters as the USSR really didn’t go in for small locomotives. According to Tim Littler, locomotive Эр772-9 previously formed part of the “strategic reserve” at Buvaida, around 23 km northeast of Kokand; the reserve is understood to have had 20 Type Er locomotives, which even into the mid-1990s (and possibly into the 2000s?) were maintained at Kokand depot and steamed and run for 100 km every year. They were reported as scrapped 2001, but confirmed to still exist in September 2002 and October 2009. There is reported to be an ‘Eu’ preserved in a park in Kokand, which is also probably an Er. There are some more photos of Эр772-9, taken by Rifat Irmuhamedov, at the My Tashkent website, where Volodya explains that the locomotive was cut into several pieces and pulled up the hill by a heavy tractor, before being welded together again. I assume the livery, which replicates the Uzbek flag, is down to modern imagination rather than a colour scheme which the loco would have carried in service. The poles and wires are apparently for floodlighting the locomotive at night – anyone got any pictures of that? Thanks to Harvey Smith and Tim Littler for providing background information and to Lisa Walker and Dmitry Kolesnikov for the photographs. We saw the old trains of Kabul as well, which was very cool. 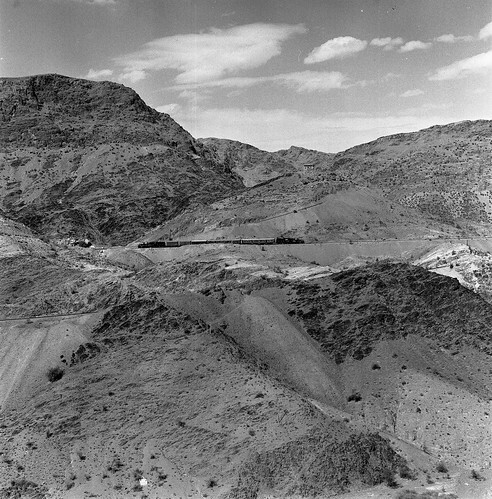 I knew there was an original railway here but I didn’t know where or if it was still in Kabul. A Day at the Afghanistan National Museum is an article by Jim Rentfrow at the website of the Green Gem Foundation, “new non-profit organization established to promote the development of ethical gemstones“. He describes a visit to the museum on 17 December 2011, with some good photos of the “non-plinthed” Henschel steam locos, which along with the remains of the coaches seem to have gained a roof over them, which is good news. Angle Iron Rail Project is Green Gem Foundation project to fund a “rudimentary rail system” based on trolleys running on angle iron tracks to ease work in gem mines in Kunduz, Nuristan or elsewhere. Apparently coal and peridot mines in Pakistan use this system. 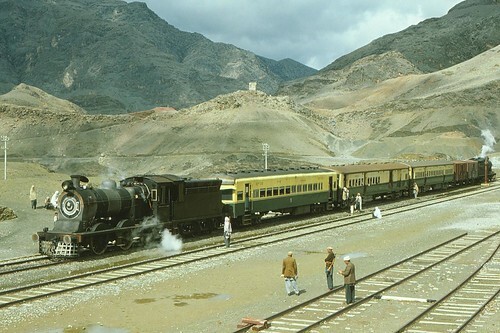 George Woods has uploaded to Flickr some wonderful photos of Pakistan Railways in 1978. There is lots of steam, including on the Khyber Pass. Well worth a browse.